Cleaning Your Chimney This Winter? Everyone should clean their chimney on a regular basis for safety and performance reasons. I don't know about you, but this is an area that I don't know much about. I came across a new site this week that looks like it could be a good resource - chimneysweeps-nearme.com Check it out and let us know what you think about it in the comments below. We have recently come across a great guide to removing your fireplace doors so that you may replace them with new ones. It makes the process painless and easy and gives detailed instructions on the removal process. Fireplace doors are one of the easiest ways to improve your fireplace decorating and create a profound impact on the look of your home! Remove and replace your fireplace doors with ease. Thinking a few steps ahead, let's go ahead and link you to the installation guide, so that you may have an easy installation process for your new doors after you remove the old ones. Are you looking for new doors to fit your Heatilator fireplace? 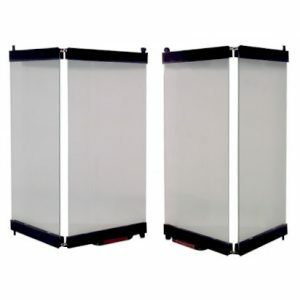 Or maybe you already have a frame and just need quality replacement doors. Lucky for you there's a new site that makes it easy to find the correct measurements and model number for your fireplace doors. Heatilatorfireplacedoors.com gives you a complete guide to finding the right door for your home based on model number, price range, and special features. If you are looking for a premium fireplace door, you can choose from many decorative frame color options as well as glass color. If you don't need fancy options and are only looking for a basic fireplace door to decorate your home and maximize heating and energy efficiency, then there are options to fit your budget and needs as well. IMPORTANT: Measure your fireplace before you order! This part is on you. Make sure to properly measure your firebox so that your Heatilator fireplace door fits snugly. More information on this can be found on the Heatilator Installation and Measuring guide. Check the inside of your fireplace. Do you see the manufacturer label? This is where the supported model numbers for replacement doors is located. Match that number on this list and order your Heatilator fireplace doors! Who doesn't love a warm spot in front of a crackling fire to unwind after a long day? This beautiful photo from New England Home shows how a few simple accessories can create an inviting space in front of the fire. Notice the simple uniform artwork above the mantel. The black mattes around the pictures complement the black fireplace surround. A white sofa and classic leather chairs with simple black and white pillows make up a soft, natural color scheme. Adding just a small pop of color on the coffee table with the orange flowers draws your eye to the center of the room's arrangement as well as the fireplace as the beautiful focal point. Be inspired! Create your own cozy spot in front of the fireplace. I love this easy, creative idea to decorate an unused fireplace for Halloween. 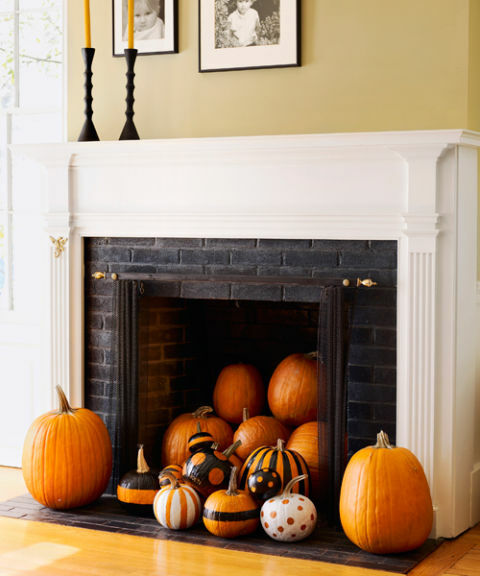 Purchase enough pumpkins in various sizes to stack inside your firebox. Be sure to get white as well as orange pumpkins. Use black and orange paint to decorate some of the pumpkins with polka dots or stripes. With no carving, the pumpkins will last longer and there's no mess. Add a few candles on the mantel and you have a fun, festive display! Thanksgiving is Just Around the Corner...Is Your Fireplace Ready? Yes, it's that time of year again. The leaves are changing colors, the air is chilly, and Thanksgiving will be here before you know it. As you think about entertaining family and friends in your home, what about your brick fireplace? Is it outdated and drab? Does it beckon everyone to gather around, relax, and visit for a while...or is is one big ugly eyesore? Don't panic, it's not hopeless! First of all...clean out your firebox. Vacuum all the soot and ashes out of your firebox and use a scrub brush and a bucket of soap and water to clean out any loose dust, dirt or soot. After the firebox is dry, paint it with a high temperature black paint. It will look brand new. Next, order the Brick-Anew do-it-yourself fireplace brick paint kit at www.brick-anew.com. It comes with all the tools and paint shades you need to do the project. The end result is a fresh "new brick" look, not a flat, solid painted look. How does your mantel look? You might consider painting it with the base coat that comes in the kit if you're not crazy about the way it looks. Take everything off your mantel and consider how a large mirror would look with a couple of candelabras or vases. Or how about a simple wreath? Stand back and take a look and see what you think. 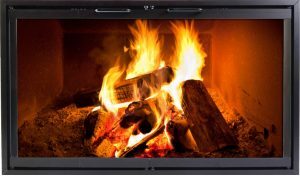 Whether you burn real wood, gas logs, or burn candles inside your firebox, the ambiance and beauty of your fireplace will be appreciated by your family and friends. And I think you'll enjoy it too! Jennifer Woch with House of J interiors became interested in interior design as a child. Her family traveled to England where historical styles and beauty influenced her as she realized how much you surroundings affect the way you feel. She describes the way she gets inspiration for a project from listening to her client's dreams and desires for a particular space. When dealing with a fireplace, she always treats it as a focal point for the room. 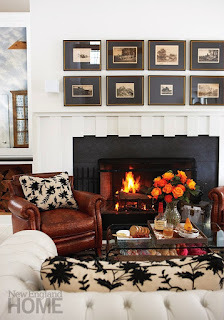 Art, mirror, candles, and seasonal decor are all great ways to accessorize a fireplace. Jen starts a fireplace redesign by removing everything from the fireplace and putting items back piece by piece so she can try a few arrangements before deciding on a final look. The fireplace in the picture here is one that Jen designed to compliment her client's new blinds. He had just purchased them and wanted to keep them in place. She didn't want to match them with the materials for the fireplace but wanted to choose something complimentary. Since her client liked earthy finishes, she decided on stacked slate with deep orange rust and dark grays. Jen decided to cover the entire wall which made a huge statement. The slate looked amazing with his hickory floors, maple cabinets, and quartz counter. Jen advises homeowners to have a plan before starting a design project. Have all the materials you need on hand. If you decide to hire a designer or decorator, be ready to ask them anything. There are no "silly" questions. She says to be sure you don't go for a magazine look unless it's truly your style. All spaces should be functional and practical for the way you live no matter what the trends are or what's in style at the moment. A well designed space will stand the test of time. Why Paint a Brick Fireplace? Since it's fireplace season, getting your fireplace ready for friends and family to enjoy is probably something you have on your mind. Check out one our most popular posts that gives some food for thought on painting your tired, outdated brick fireplace. Imagine the ideal living room with the family gathered together around the fireplace. It’s brick, right? Traditional, attractive, natural. So why would someone paint over that brick? Many people are opposed “on principle” to the idea of painting a brick fireplace. Of course personal preference is a factor in any remodeling decision. However, there are several circumstances where painting a brick fireplace might be your best option. If all fireplaces were as beautiful as the one you imagined in your ideal living room, there might be no need to paint them. But in reality, many fireplaces look just plain ugly. Styles change. Even high-quality bricks may look dated and out of style. Painting with the right technique can significantly improve the look of your brick fireplace and your entire living area. 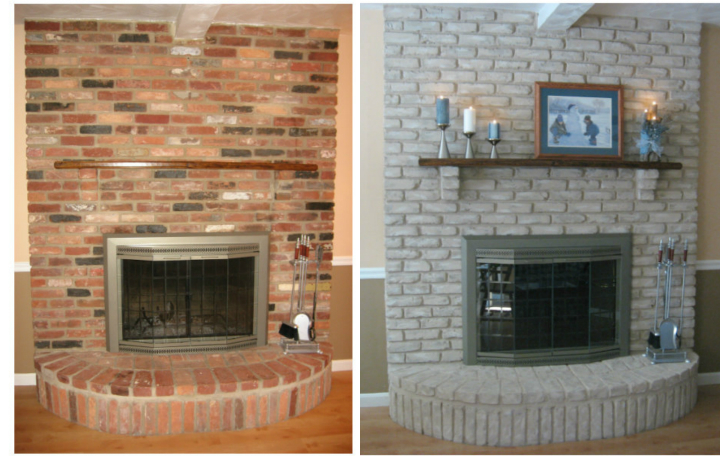 The right technique can make the difference between a flat, painted fireplace and “real-looking” brick. Try a pre-assembled fireplace paint kit to get all the tools and paint you need as well as instructions for painting brick with the correct technique. 2. Cover Repaired or Discolored Bricks.Some older fireplaces may have “bad spots” with replaced bricks or patched mortar. Repaired or replaced bricks may not match the look of the original bricks in your fireplace. Even if every effort was made to match the repaired brick with the original, the repair might still be visible and may have aged differently. Even cleaning fireplace bricks can change how they look. Have you ever tried to remove soot, residue, or even crayon from a brick? It may take strong chemicals, harsh abrasives, or serious scrubbing to get stubborn stains off brick. This can remove the exposed outer layer of the brick, making the cleaned brick stand out from its more “weathered” neighbors. Painting your fireplace covers over these “surface” differences in brick, giving your fireplace a new, unified appearance. As a bonus, a high-quality base coat of paint will seal the brick and protect it from further damage. 3. Cover or Improve an Existing Paint Job. Removing paint from a brick fireplace may sound like “the right thing to do,” but once you get down to it the process is messy, expensive, tedious, and potentially dangerous. Solvents and chemicals are often toxic and usually include dangerous acids that can cause severe damage to humans and pets. Sandblasting is generally not recommended for indoor brick and in any case can leave brick damaged or with an “uneven” appearance that you might have to paint over anyway. Obsessively scrubbing bricks and mortar with a wire brush could take weeks or even months. And after all that paint removal work, you might very well find damaged or unsightly brick—the reason it was painted over in the first place. Other methods of dealing with painted brick have their own drawbacks. Tearing out a brick fireplace to replace it can cost several thousand dollars while leaving you at the mercy of a contractor. And granite or marble can be even more expensive. Option 1: Painting your fireplace brick with a solid coat of paint. Cost: $75 worth of paint and supplies should be enough for two coats of paint. Advantages: If you do decide to paint your brick fireplace, you can pick the color to match your décor. 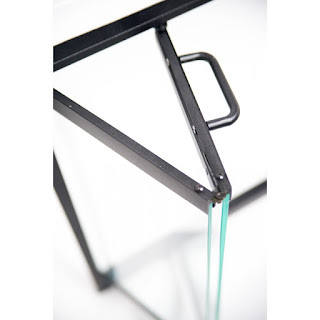 This will give your fireplace a clean, uniform appearance in a solid color. Drawbacks: Your fireplace will have an unmistakable “painted” look. Very difficult to remove paint from brick. 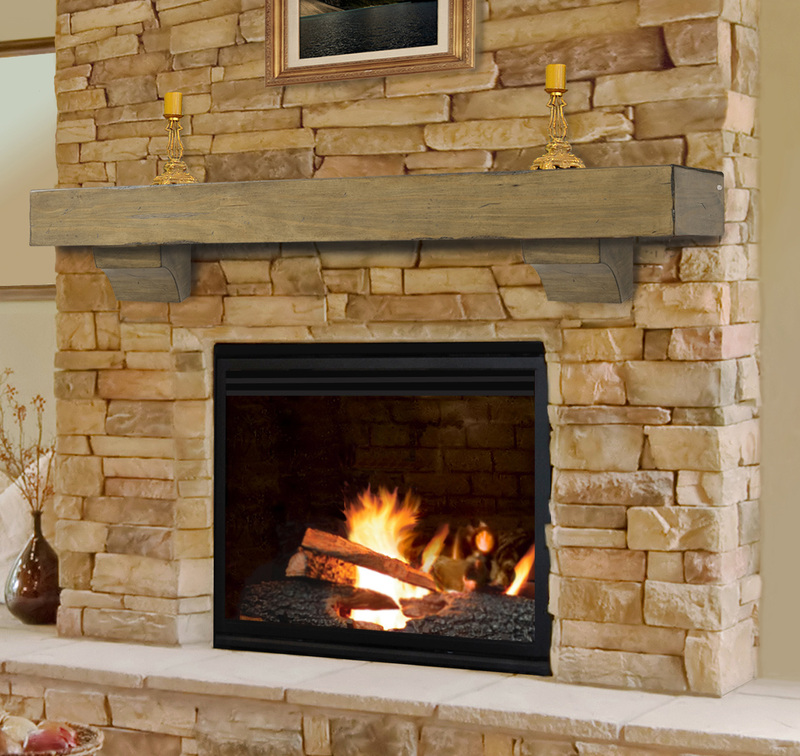 Option 2: Remodel your fireplace brick for a “real brick” look using a do-it-yourself paint kit. Cost: $200 for an all-in-one kit with several colors of paint including a protective base coat/sealer, supplies, and instructions. Advantages: Easy and affordable. Try a pre-assembled fireplace paint kit to give your ugly fireplace a rejuvenated “real brick” look. Drawbacks: Very difficult to remove paint from brick. 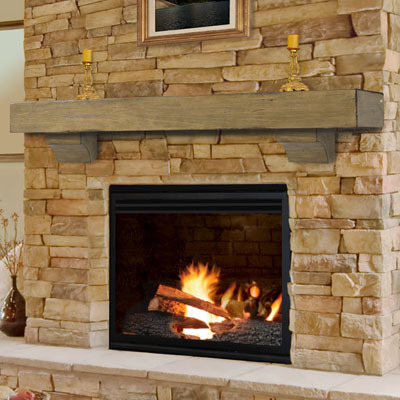 Option 3: Tear out and totally remodel your fireplace in brick, stone, granite, or marble. Cost: $3,000 to $8,000 to hire a contractor for complete demolition and replacement of the existing fireplace with a brand new one. Advantages: You will end up with a brand new fireplace built to your specifications. This may sound like a daunting project, but the results can be spectacular. Drawbacks: Expensive, time-consuming, messy, and you have to have a contractor do the heavy demolition and construction work. Although a completely new fireplace may be an “ideal” solution to an ugly fireplace, you may find that a newly painted fireplace can be a huge improvement—at a fraction of the cost. 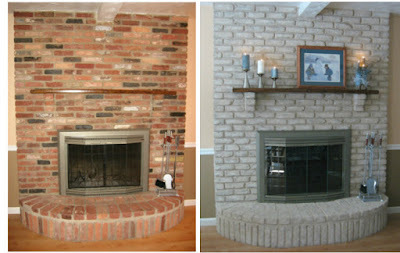 Painting a brick fireplace is an inexpensive upgrade that can make a world of difference in how your fireplace looks. Especially at a time when everyone could use a little extra equity, painting your fireplace adds a great deal of value to your home. Giving your space a more modern look will help attract buyers, just ask many home flippers who have been using this secret themselves. Take a moment to consider all of the fireplace paint products available and decide what works best for your space's decor. Painting a Brick Fireplace: Against the Rules? Is painting brick a bad idea? This article lays out the pros and cons. Can Mr. Fix-It Remodel the Fireplace Himself? An inexpensive and practical DIY solution for a fireplace that needs remodeling. Practical questions to ask yourself about the remodeling project you are planning.